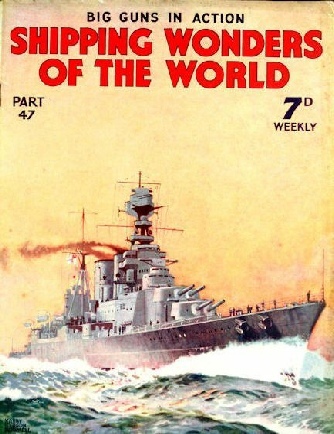 Part 47 of Shipping Wonders of the World was published on Tuesday 29th December 1936. 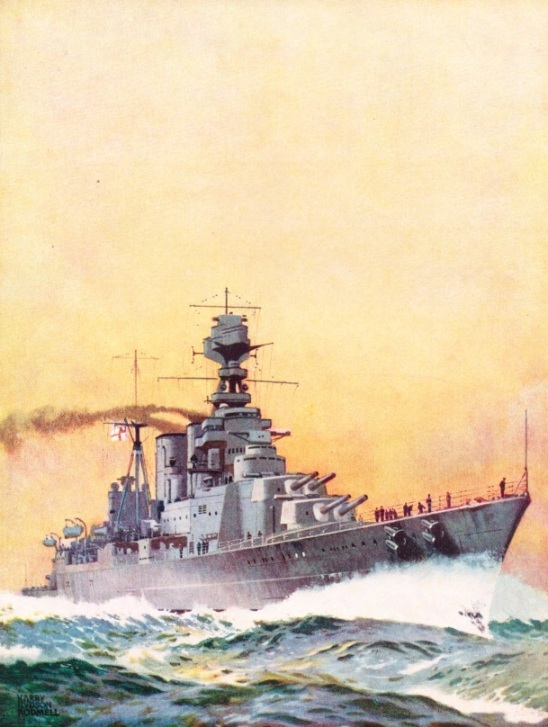 This issue included a colour plate illustrating HMS Hood, as part of the chapter on Big Guns in Action. The plate was attached to page 1421 of this part, and also appeared on the cover of this issue. This week’s cover, showing HMS Hood, was specially painted for Shipping Wonders of the World by H H Rodmell. This attractive picture also forms the subject of the colour plate in this week’s part. The account of the refloating of the United States battleship Maine by David Masters. This is the ninth article in the series Dramas of Salvage and is concluded from part 46. THE DOOMED VESSEL. The battleship Maine was sent by the US Government to Havana, Cuba, to protect the interests of American citizens. She arrived on January 25, 1898, and blew up at 9.40 in the evening of February 15. The Maine, of 6,650 tons displacement, was built at New York in 1890. Her length was 324 feet, her beam 57 feet and her draught 21 ft 7 in. Her engines, with an indicated horse-power of 8,750, gave her a speed of 17 knots. 1929 at Copenhagen by Burmeister and Wain for the Finland Line, which maintains services between Finnish and North Sea ports. 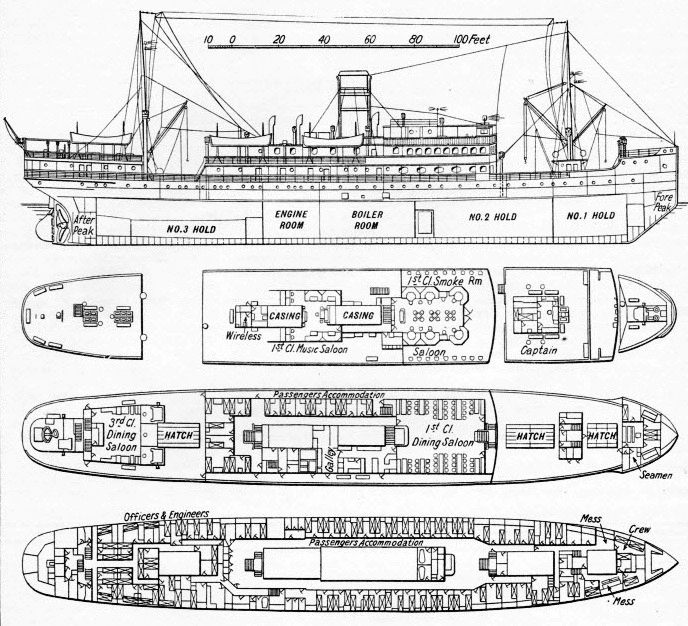 She has comfortable accommodation, in positions indicated on the drawing below, for 90 first-class and 60 third-class passengers. She has a gross tonnage of 2,365 and a hold capacity of 69,000 cubic feet. The Ilmatar draws 18 ft 0½ in of water in loaded condition. Her length is 270 ft 1 in between perpendiculars. She has a beam of 41 ft 7 in and a depth of 23 ft 8 in. 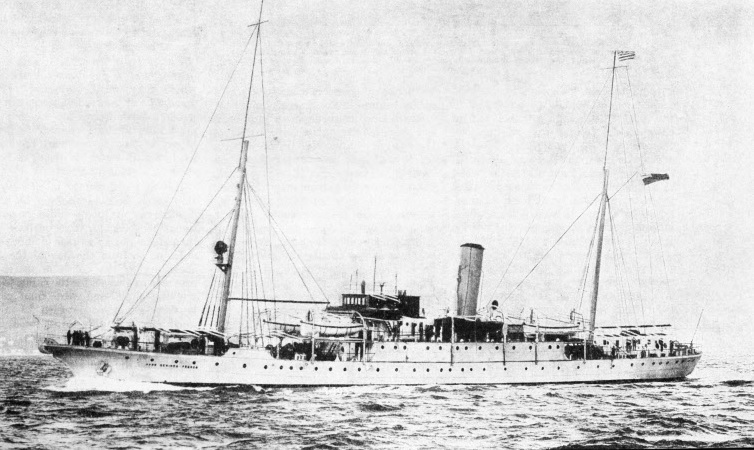 The Ilmatar is propelled by u triple-expansion steam engine taking steam from Scotch boilers situated amidships. Their exhausts go into a handsome funnel with a cowl top. The cargo is carried in three holds, two being forward and one abaft the machinery space, but a considerable part of the ship is devoted to the passenger accommodation, this being arranged in the 'tween decks, on the main deck and on the superstructure, where there is a smoking-room and a glassed-in veranda. The Ilmatar is a sturdy little vessel more than capable of standing up to the-heavy weather which she regularly encounters. This is the thirty-seventh article in the series on Merchant Ship Types. The firing of a salvo from a modern warship is an unforgettable experience, overpowering in its effect on the senses and on the imagination. Modern gunnery is so technically perfect that hits can be registered on targets invisible to the naked eye. The gun is still the principal weapon in naval warfare, not even excepting the torpedo. Naval gunnery is becoming more and more of an exact science. 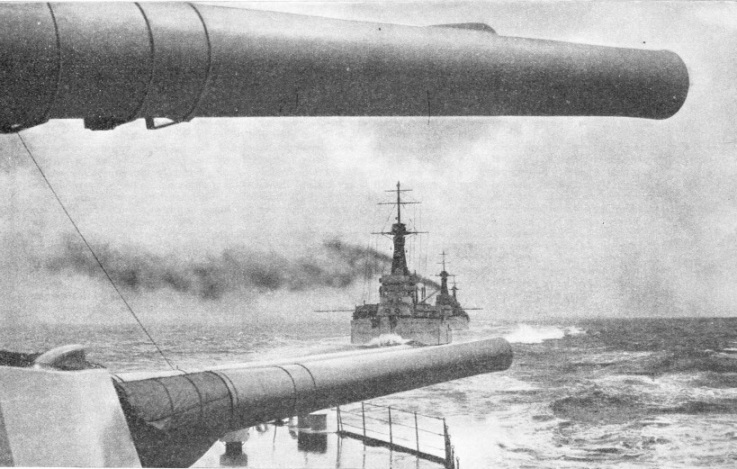 In the time of Nelson guns could not score hits at a range of above half a mile. Nowadays, however, naval guns have an effective range of ten miles and more, and gunners can score a hit on a target that is out of their sight below the horizon. In this chapter Hector Bywater explains how this is done. His chapter contains valuable statistics, and gives a comprehensive account of modern naval gunnery. This is the twelfth article in the series The Navy Goes to Work. There is another article on The Ship and the Gun in part 52. PIERS 40 AND 41 OF THE SEATTLE PORT COMMISSION claim to be the largest of their type in the world. Pier 40 has seven sheds each as large as the ordinary pier’s transit shed. Pier 41 can berth four vessels as large at the Queen Mary. There is a depth of 35 feet alongside at low tide. The piers are situated at the north side of Elliott Bay, which is an indentation of Puget Sound. Speedy communication by telegraph from continent to continent was first made possible by the specialized work of the cable-laying and repair ships. The subject of cable-laying is an interesting one. The preparatory work involves surveys of the ocean bed which - contrary to a general belief that it is relatively flat - may consist of considerable submerged mountains. Cables of three distinct kinds are made - shore-end, intermediate and deep-sea. Deep-sea cables lie securely on the bed of the ocean and are subject to no great stresses in normal conditions. Shore-end cables, however, which are sued for the section of the telegraph line which connect the cables houses on shore with the intermediate sections, are subject to comparatively rough treatment from the action of seas and rocks, and are considerably stronger than deep-sea cables. This chapter is by a cable ship captain, Capt. S A Garnham, in which he describes the work of surveying the route, laying the cable and carrying out necessary repairs. He also contributed a subsequent article on Cable Ships at Work. You can read more on the first Atlantic cable in Wonders of World Engineering. The largest city on the Pacific North-West, Seattle received her first white settlers in 1851. Since then, thanks to her extensive harbours and to the unrivalled natural resources of the State of Washington, the port had grown with amazing rapidity. A dominating personality in the early days of Seattle was John Pennell. He was a questionable character and something of an adventurer, but he did much to build up the city of Seattle. Later the city was almost completely destroyed by a fire. Seattle, however, rose phoenix-like from the ashes and, in place of the ugly buildings which had been burned down, beautiful business blocks and wide streets were planned, so that to-day Seattle is a fine city. Gold brought prosperity to Seattle, for it is one of the nearest US ports to Alaska, and it grew gradually into the major port it is to-day. This chapter is by a new contributor, H D Fadden, who is an American writer. This is the fourteenth article in the series on Great Ports of the World. That familiar London landmark, Cleopatra’s Needle, now on the Victoria Embankment, was towed from Egypt in a vessel, the Cleopatra, which had been specially built round the obelisk. After abandonment in tragic circumstances during a storm in the Bay of Biscay, the Cleopatra safely reached Gravesend, Kent, on January 21, 1878. Despite its name, this obelisk was not built by Cleopatra, but by Thothmes III nearly 3,500 years ago. The Needle must have seen many strange events in its time, but none so strange as its journey to London. A ship had to be built specially for this purpose. The Needle was jacked up and a ship, appropriately named the Cleopatra, was built round it. The vessel, which presented an extraordinary appearance, was towed from Alexandria, with London as her destination. All went well until the Cleopatra reached the Bay of Biscay, where a terrible storm was encountered. The unwieldiness of the Cleopatra's cargo did not improve matters. Eventually she had to be abandoned, but she was late salved, and the Needle came safely to England after many adventures. This little-known and fascinating story is told here by C. Hamilton Ellis. A TWIN-SCREW CABLE SHIP of 1,984 tons gross, the Lady Denison-Pender was built in 1920. She has a spoon stern and at her bows are the sheaves over which the cable is paid out or taken in. The vessel belongs to the Eastern Telegraph Company Ltd. She has a length of 269 ft 3 in between perpendiculars, a beam of 38 ft 1 in and a moulded depth of 25 feet. From the general appearance of a merchant ship and from the number and arrangement of decks, it is often possible to tell the nature of the trade on which she is employed or for which she was built. Thus deck arrangement forms a suitable key for the classification of merchant ships. This chapter is by A C Hardy. Many famous warships of the eighteenth and early nineteenth centuries were built at Buckler’s Hard, on the Beaulieu River, Hampshire, a place conveniently situated near the stout oaks of the New Forest. It is hard to credit that the peaceful village of Buckler’s Hard was once renowned as a shipbuilding centre. Yet it was so, and many of the “wooden walls” were built there, including the Pandora, famous in connexion with the story of the Bounty, and the Agamemnon, the Euryalus, and the Swiftsure, which were at Trafalgar. This chapter is by B Lavis. 6 in and a displacement tonnage of 42,100. She is armed with eight 15-in, twelve 5.5-in and four 4-in anti-aircraft guns, in addition to twenty-three smaller pieces and six 21-in torpedo tubes. An important feature of this huge vessel is the extent of her protective armour. Her geared turbines have a designed horse-power of 144,000 and give her, through four shafts, a speed of 31 knots. The cost of HMS Hood is estimated at £6,025,000. She underwent a general refit in 1929-30 and is due for replacement in 1941. This colour plate also appeared on the cover of this issue and the artist is Harry Hudson Rodmell, whose signature can be seen in the lower left hand corner. IN DOCK AT ALEXANDRIA ready for the voyage to England. 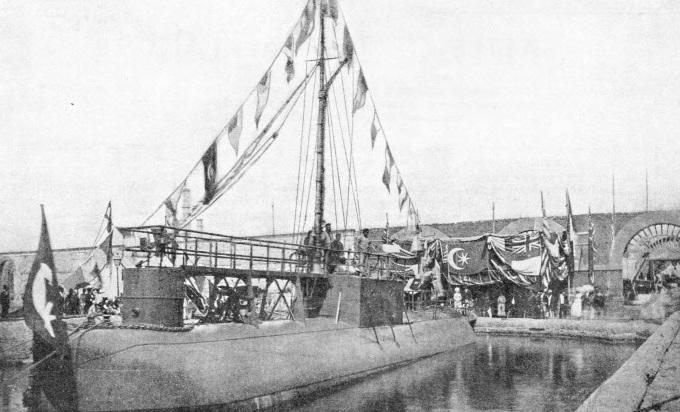 The Cleopatra, containing the obelisk, was fitted out as a sea-going vessel. On the upper part was built a narrow deckhouse, containing cabins for the captain and her crew who were to travel in her. Forward rose a small cylindrical column, to act as cutwater and to support the small hurricane deck which ran after over the top of the deckhouse. The Cleopatra, towed by the Olga, left Alexandria on September 21, 1877. She passed through the Mediterranean without incident but had to be abandoned during a storm in the Bay of Biscay. Salved by the cargo vessel Fitzmaurice, she was towed into Ferrol, in north-west Spain, whence she was towed by the tug Anglia to Gravesend. Having inflicted defeat on Admiral Cradock’s squadron off Coronel on November 1, 1914, von Spee’s German squadron was almost annihilated little over a month later after a sensational action off the Falkland Islands. This chapter is by Lieut.-Commander E Keble Chatterton and is the seventh article in the series on Decisive Naval Actions. The article is concluded in part 48. 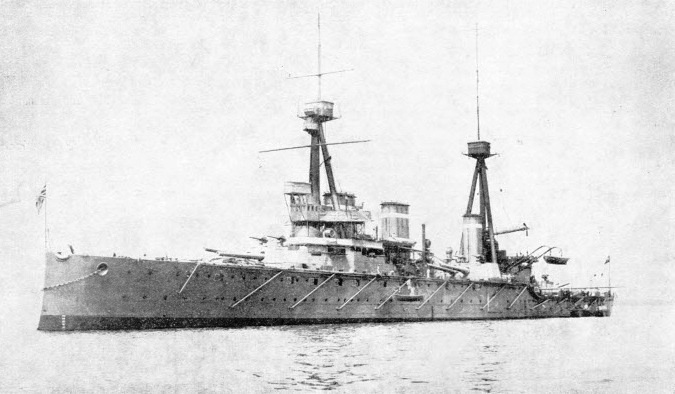 ADMIRAL STURDEE’S FLAGSHIP, the cruiser Invincible. After the defeat off Coronel the British Admiralty replied with amazing vigour and celerity. Two battle cruisers, the Invincible and the Inflexible, were detached from the Grand Fleet and sent secretly to the Falklands. They were sister ships having a displacement of 17,250 tons, an armament of eight 12-in and sixteen 4-in guns, and a speed of 25 knots. This secret reinforcement made possible the destruction of von Spee’s squadron. THE GRAND FLEET IN THE NORTH SEA during the war of 1914-18. Framed by the mighty guns of the Queen Elizabeth are the Orion and her consorts astern of their flagship. The Queen Elizabeth, of 31,100 tons displacement, is armed with eight 15-in 42 calibre and twelve 6-in 50 calibre guns, in addition to twenty-five smaller pieces and two 21-in torpedo tubes.